What a productive day - first a blog makeover and now a new post! The Muse visited briefly after I read about a neat little mobile game this afternoon. 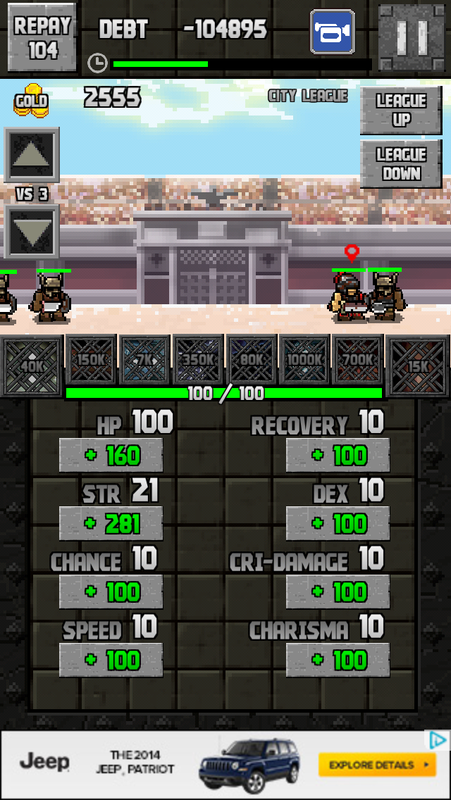 It's called Poor Gladiator, and it's kind of a sim/tycoon/roguelike? There's a pretty good review of it over at TouchArcade, but it basically boils down to partially controlling a little gladiator who must kill to earn money and dig his way out of debt. That debt grows every 30 seconds, and if he can't make a payment it's the end of the line. You have to decide how to spend his earnings - either leveling up stats or putting money towards his ever-increasing debt. Damn you, compound interest. You can also adjust the number and difficulty of his foes. More slaying = more money, as so often tends to be the case. Charisma is an integral skill for any bout. Anyway, I downloaded it during my lunch break and gave it a little spin. 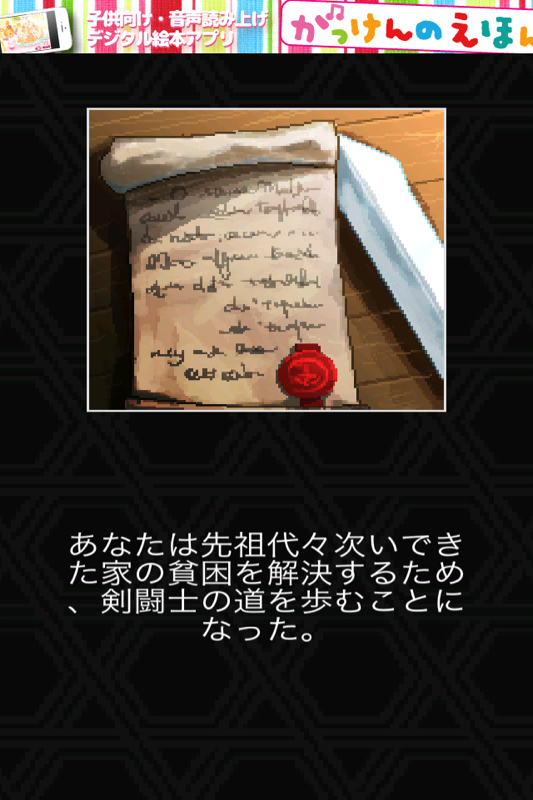 Much to my surprise, the intro splash screen was followed up by little story, which greeted me in Japanese! Translation: "Blah blah blah - you're in debt so kill stuff for money." The story, it is deep. Ha, even Japanese ads! It still surprises me, how many apps will magically 'turn Japanese' when you switch your phone's language settings. While this may not actually be "study" per se, I maintain that it's a great way to keep your language skills sharp. If you're lucky you may even pick up a few words when you're not rapidfire tapping through text. Oh, and surprising passengers with Japanese turn-by-turn guidance a'la Siri or Google Maps is always amusing.